the lawyer you choose will make the difference. No one plans to be catastrophically injured. That is why, when you have been hurt because of someone else’s negligence, you have legal options available to you that can help protect your family and your future. When it comes to securing the best possible outcome, you deserve a team of seasoned Charlotte personal injury lawyers on your side. At Warren & Kallianos, we are proud of our established record of successfully representing accident victims and their families, as well as surviving family members in wrongful death claims. We have secured millions for our clients in injury cases throughout the state. You can have peace of mind putting your trust in a lawyer from one of Charlotte’s most recognized personal injury firms. Whatever the situation, when you retain our law firm, you will be assured of working closely and directly with our attorneys, who will be there to walk you through the process at every step. You might be surprised by how often we meet with clients who say, “I’m not really the lawsuit type.” The truth is, there’s no such thing as a “lawsuit type.” We work with people who have been seriously injured in ways that alter their lives forever. We work on behalf of families whose loved ones were killed through no fault of their own, and who now struggle to keep a roof over their heads or pay the bills, because the creditors just keep calling. We help injury victims and their families obtain the compensation they are entitled to receive, so they can focus on their recovery. Car accidents. As one of the well-known injury law firms in Charlotte, we have spent decades assisting people who have been injured because of negligent drivers, defective auto parts, hazardous roadways, and more. Even a so-called “minor” car accident can still leave you in chronic pain and unable to work. We can address your questions and help you plan for your future. Truck accidents. A 5,000 lbs. car stands little chance against a fully loaded, 80,000 lbs. big rig. Truck accidents are often catastrophic in nature, leading to permanent injuries and thousands of dollars in property damage. We know what to do. Catastrophic injuries. A catastrophic injury is one that alters the way you live permanently. Traumatic brain injuries, loss of limb, spinal cord injuries, burn injuries: a person who sustains these harms must deal with long-term issues such as ongoing medical treatment, loss of income, and permanent pain, suffering and disability. At Warren & Kallianos, we have the experience to help you with issues like these and more. Workers’ compensation. Most people who get hurt at work know that they are likely entitled to workers’ compensation benefits, but they are often unsure about many other details. Can I bring a third-party claim? How can I get the medical treatment I need? Talk to us today to find out how we can help you with these and other issues. Construction accidents. Construction sites are some of the most dangerous workplaces in the country. Charlotte’s booming construction scene is no different. Many victims of construction accidents don’t understand the full extent of benefits they may recover. At Warren & Kallianos, we understand the rights of injured construction workers – including the right to fair compensation without regard to immigration status. Premises liability. Property owners and managers owe their visitors a duty of care, to ensure that their premises are safe and secure. Many times, people come to us with what they think is one type of case, when in reality, they have a premises liability claim. For example, if a building owner failed to fix a broken light and you are mugged, or failed to address an unsafe stairwell and you fall – these are premises liability claims. Warren & Kallianos is prepared to handle premises liability cases against owners of public or private property, as well as government property. Motorcycle accidents. Other drivers aren’t always respectful to bikers when it comes to sharing the road. Because riders lack the physical protection of a car, their injuries tend to be more severe, and often deadly. We represent bikers in Charlotte and throughout the state when they are injured in a crash. Pedestrians and cyclists. Charlotte has some of the prettiest footpaths and bike routes in the state, but there are also designated areas for pedestrians and bike riders in the heart of our city. If you are walking or riding, and are struck by a negligent driver, we can protect your rights. Nursing home abuse and neglect. Residents of nursing homes and other long-term care facilities are some of the most vulnerable people in our society. When a nursing home fails to provide a safe environment for the people entrusted with their care, compensation may be available under the law. If you are concerned about the care your loved one is receiving in a nursing home, you have an advocate in the attorneys at Warren & Kallianos. Talk to us now to find out how we can stand up for your loved one’s safety and dignity. Medical malpractice. Sometimes a medical procedure leaves the patient worse off than before. Although not every unwanted result is medical malpractice, sometimes the cause was, in fact, a negligent medical error. It is never wrong to question an unexpected outcome from a medical procedure. We handle claims involving negligent medical personnel and staff, birth injuries, labor and post-partum injuries, surgical errors, and more. Wrongful death. There is no “quick cure” for the pain of losing a loved one, we know. No amount of money will bring him or her home to you. What a wrongful death lawsuit does is ensure that responsible party is held to account for the neglect and reckless behavior that led to your loved one’s death. It can also help you protect your family, so you can focus on healing. Product liability. As a consumer, you have the right to expect that the products you buy will work in the way they are intended. If a design flaw or a manufacturing error leads to your injuries, or if retailer or manufacturer failed to warn you of potential dangers – with your medication, with your children’s toys, with products you buy for your home or your off-time activities – you may be entitled to compensation. Why choose Warren & Kallianos for your Charlotte injury firm? Dedicated Charlotte personal injury attorneys Jeff Warren and Chris Kallianos have more than a half century of combined legal experience. Since founding the firm in 1992, Jeff and Chris have successfully fought for the rights of injured people in a wide variety of cases. We invite you to read more about our firm and our philosophy. 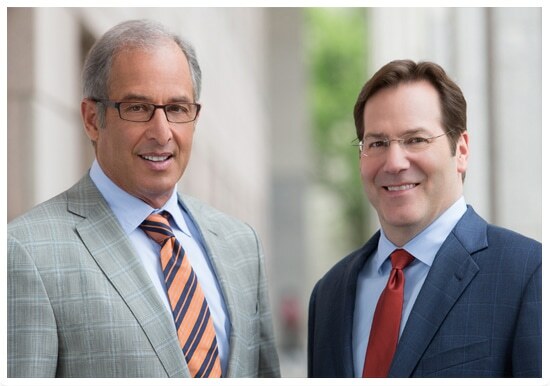 When you work with the law firm of Warren & Kallianos, you work directly with attorneys Jeff Warren and Chris Kallianos. You won’t get handed off to a low-level assistant, never to see your attorney again. Instead, Jeff and Chris are accessible to their clients throughout the life of the case. Most clients work with just one paralegal, instead of talking to someone new each time they call. Jeff and Chris take pride in understanding the facts of each client’s case and how the law applies to the matter. They also stay on top of each client’s file as the case unfolds. In addition to close and frequent interaction with the personal injury attorneys at Warren & Kallianos, you can also count on them to deliver the aggressive, attentive and high-quality legal representation that is necessary to get results. Our reputation gives your case immediate credibility with insurance companies and their lawyers. We are often able to negotiate full and fair settlements for our clients. We also have the skill and experience to take a case to court when necessary to secure justice for our clients. Jeff and Chris have also earned the respect and recognition of their peers and former clients as evidenced by the numerous honors they have received, including selection in the Best Lawyers in America, Super Lawyers, Top 100 Trial Lawyers, and members of the Million Dollars Advocates Forum. At Warren & Kallianos, we know that when winning means everything, the lawyer you choose will make the difference. That’s why we are committed to providing personalized service to each of our clients. To schedule a free initial consultation at our office in Charlotte, please call 704-377-7777 or fill out our contact form.